Stems: Erect, upwardly branched, rough-hairy. Leaves: Chiefly alternate but lowermost opposite, long stalked, blade triangular-ovate or broader, 4 to 16 inches long, about 1/2 as wide; base heart-shaped or truncate; margins toothed or nearly entire. Inflorescences: Heads large, borne on long stalks, stalks with wide-spreading hairs. Flowers: Disk more than 1 inch across; involcural bracts ovate to ovate-lanceolate, more than 1/6 inch wide, coarse-hairy, gradually tapering to slender tip, margin usually fringed; ray florets 17 or more, in single series, yellow, ligule 1 inch or longer, infertile; disk florets numerous, reddish to purplish or rarely yellow, fertile, chaffy bracts deeply 3-toothed. Fruits: Achenes, compressed, 1/8 to 3/5 inch long, glabrous or pubescent; pappus of 2 principal awns, sometimes small, secondary scales present. Habitat: Open, disturbed areas, roadsides, and low moist ground. Uses: Nearly all parts of this plant can be utilized. The seeds can be eaten raw, cooked, roasted, or dried and ground for use in bread or cakes. The seeds and the roasted seed shells have been used as a coffee substitute. Oil can be extracted and used for cooking and soap making. Yellow dyes have been made from the flowers, and black dyes from the seeds. The residue oil cake has been used as cattle and poultry feed, and high quality silage can be made from the whole plant. The buoyant pith of the stalk has been used in the making of life preservers. Comments: The state flower of Kansas, by enactment of the 1903 Kansas Legislature. When actively growing, the flowers and leaves follow the sun as it traverses the sky. 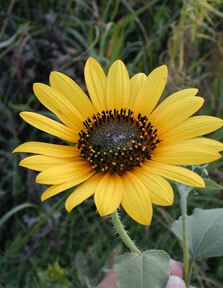 Sunflowers were cultivated by Native Americans well over 1000 years ago. It is one of a small number of agricultural plants to originate north of Mexico in North America. The large-headed cultivated sunflowers grown today as crops were derived from Helianthus annuus. Common sunflower is listed as a noxious weed in Iowa.